Imagine, for a moment, that you have spent more than two decades in painfully laborious research-- that you have discovered an incredibly simple, electronic approach to curing literally every disease on the planet caused by viruses and bacteria . Indeed, it is a discovery that would end the pain and suffering of countless millions and change life on Earth forever. Certainly, the medical world would rush to embrace you with every imaginable accolade and financial reward imaginable. You would think so, wouldn?t you? Now, assuming your amazing cure is an electronic instrument, the only cost of using it is electricity. And it is absolutely harmless to patients, who can recover without losing their hair, the family home, and their life savings. So, with your technology, there is no longer any reason for people with cancer to pay over $300,000 per patient -- to become deathly ill from chemotherapy, radiation treatments, and the mutilation of surgery. It sounds like you won't find many friends and support among practicing oncologists, radiologists, and surgeons, doesn't it? 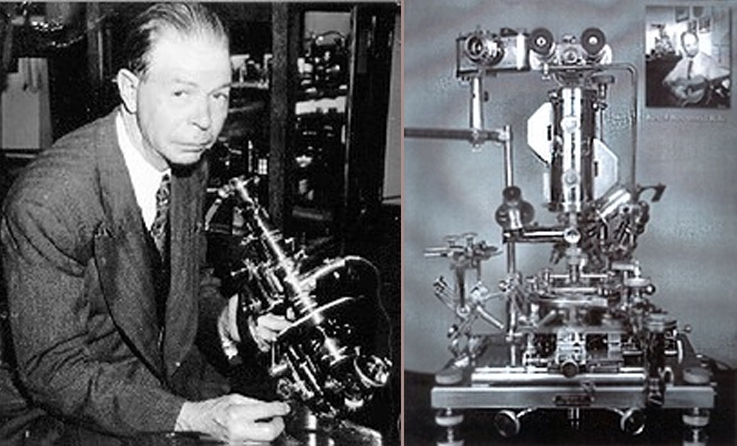 Rife's inventions include a heterodyning ultraviolet microscope, a micro-dissector, and a micro-manipulator. When you thoroughly understand Rife's achievements, you may well decide that he has the most gifted, versatile, scientific mind in human history. 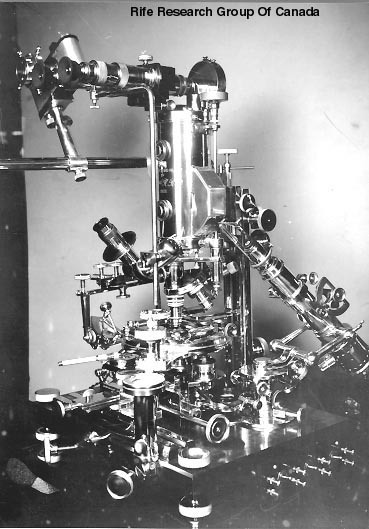 Nevertheless, many scientists and doctors have since confirmed Rife's discovery of the cancer virus and its pleomorphic nature, using dark field techniques, the Naessens microscope, and laboratory experiments. Rife also worked with the top scientists and doctors of his day who also confirmed or endorsed various areas of his work. They included: E.C. Rosenow, Sr. (longtime Chief of Bacteriology, Mayo Clinic); Arthur Kendall (Director, Northwestern Medical School); Dr. George Dock (internationally-renowned); Alvin Foord (famous pathologist); Rufus Klein-Schmidt (President of USC); R.T. Hamer (Superintendent, Paradise Valley Sanitarium; Dr. Milbank Johnson (Director of the Southern California AMA); Whalen Morrison (Chief Surgeon, Santa Fe Railway); George Fischer (Children?s Hospital, N.Y.); Edward Kopps (Metabolic Clinic, La Jolla); Karl Meyer (Hooper Foundation, S.F. ); M. Zite (Chicago University); and many others. At first, a token attempt was made to buy out Rife. Morris Fishbein, who had acquired the entire stock of the American Medical Association by 1934, sent an attorney to Rife with 'an offer you can't refuse.' Rife refused. We many never know the exact terms of this offer. But we do know the terms of the offer Fishbein made to Harry Hoxsey for control of his herbal cancer remedy. Fishbein's associates would receive all profits for nine years and Hoxey would receive nothing. Then, if they were satisfied that it worked, Hoxsey would begin to receive 10% of the profits. Hoxsey decided that he would rather continue to make all the profits himself. When Hoxsey turned Fishbein down, Fishbein used his immensely powerfulpolitical connections to have Hoxsey arrested 125 times in a period of 16 months. The charges (based on practice without a license) were always thrown out of court, but the harassment drove Hoxsey insane. Dr. George Dock, another prominent figure who collaborated with Rife, was silenced with an enormous grant, along with the highest honors the American Medical Association could bestow. Between the carrots and the sticks, everyone except Dr. Couche and Dr. Milbank Johnson gave up Rife's work and went back to prescribing drugs.